Last week my friend SK brought some cookies to a luncheon gathering and shared with us. They were the most crunchy and delicious cookies that I’ve ever tasted. It got me recall the old fashioned peanut butter cookies with criss-cross pattern, a favourite treat for young kids. Yet, the cookies made by my friend were a bit different from the old-fashioned ones as she added some extras, including some nuts and chocolate chips. I asked for her recipe of course. Thanks so much for her generosity. 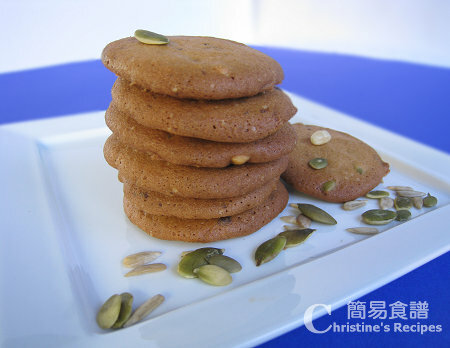 All ingredients in this peanut butter cookie recipe are blended and balanced so well. I like her idea of adding the extras. So I followed her recipe and mixed in some petitas, sunflower kernels as well as a bit of pine nuts. It turned out really good, enriched with more texture of natural nuts. You might like to omit the extras and retain the traditional taste of peanut butter cookies, or replace with peanuts if you desire though. Beat butter, sugar and peanut butter with an electric mixer for 3 minutes at high speed. Add egg and vanilla. Continue to beat till mixture is fluffy. Sift in flour and baking soda and combine well. If you desire extras, add nuts and chocolate chips to your liking. Chill the mixture in fridge for about an hour. Use a teaspoon to place the mixture on baking tray, lined with baking paper. Lightly press the middle and let it flatten a bit. Leave about 4cm apart because the cookies will spread when cooked. Bake in preheated oven at 200C (392F) or 180C (fan forced, 356F) for about 20 minutes, or until golden brown. Transfer to cooling rack and let cool. Enjoy! Bake cookies in batches. Keep the rest of batter in fridge if not use. Use fan-forced oven to get better results. The colour of cookies would be more even. The time of cooking depends on the power of oven you use. Don’t leave them unattended when baking. 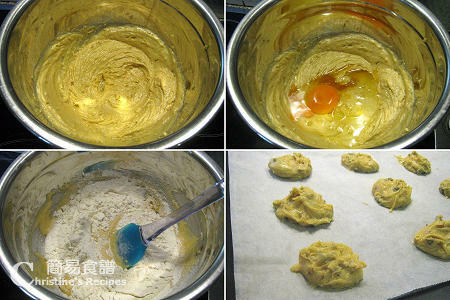 When the colour is turned to golden brown, the cookies are ready. I never used to be a big fan of peanut butter cookies but they are starting to grow on me. Your version looks amazing. Thanks for sharing! I've been spoiling my hubby lately with cookies and this looks like a good one. We eat so much peanut butter now - it looks like we have a problem! Another Chinese New Year cookies. Make me miss home now. I love peanut cookies with lots of peanutty flavour. These looks so good. I need a handful to go with my hot coffee now. yum!! I adore peanut butter cookies! MMMMMMM,...your cookies look the best, Christine!! MMMMMMM,...all the way!! They won't last for long at my house! I miss Chinese New Year too. Hey, Christmas is around the corner. These cookies are wonderful snacks for the season. I love peanut butter cookies, and the extras in these sound fantastic! I'm always up for PB! Would love to see you submit a cookie recipe in the Virtual Holiday Cookie Crawl. Hi Christine, 1/2 cup peanut butter is equivalent to how much in grams? What sort of peanut butter should be used - smooth or crunchy type? Do you mind giving me this recipe in Grams as I'm not familiar with cups. Sorry, this recipe was done a long long time ago. And I haven't got a record in grams at that time. If I make these cookies again, will update this recipe. Your receipe is so easy and yummy... i love all of it. Just to check with you, can i use self raising flour instead of plain flour? Sure, you can use self raising flour instead. You might've known that self raising flour has already incorporated a rising agent, so skip the baking soda. And the texture of your end product might be slightly different from mine.